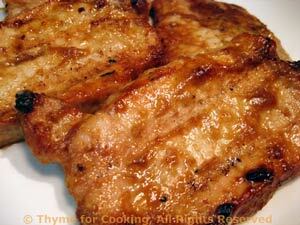 Pork Chops with Peanut Marinade, easy mid-week dinner. Peanut butter adds an interesting flavor to marinades and salad dressings: subtle, not at all dominate. You could use tahini (sesame seed paste) or another nut butter if you have peanut allergies. 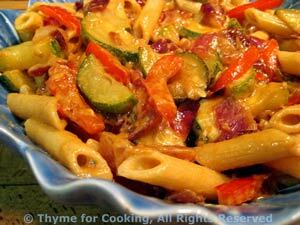 The vegetables for the pasta are lightly cooked, making this a warm, rather than cold salad. Slice onion, mince garlic and ginger. Slice the red pepper the long way then cut slices in half. Cut zucchini in half the long way, then into 1/4" (6cm) slices. Add onion, sauté 5 minutes. Add garlic, ginger, pepper and zucchini; turn heat to medium and sauté 6 - 10 minutes longer, depending on how crisp/done you like. When done to your liking add Dressing and pasta, toss to combine and serve. I sautéed the veg just until the zucchini started to get limp, about 7 minutes. Combine peanut butter, mustard, ginger and soy sauce in small bowl. Add vinegar and oils, whisk well.